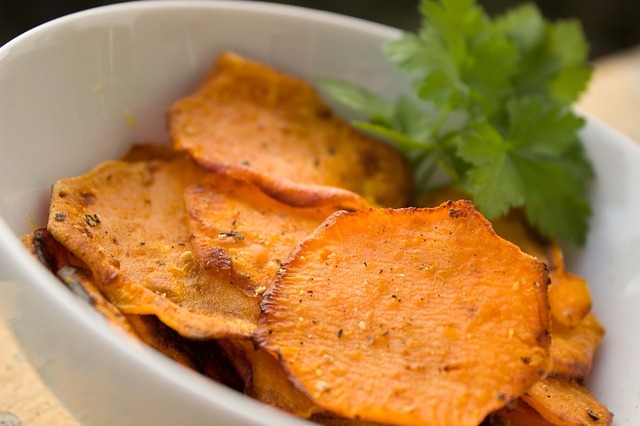 Oven baked kumara chips are delicious but they are starchy carbohydrates so, if you’re watching your weight, it’s a good idea to limit the amount of these that you eat. A handful, not the whole plate if you know what I mean. Slice the kumara/potato into wedges or slices, whichever you prefer. Brush them with oil. I like to pop the oil in a bag, add the kumara and shake it to make sure they’re nice and covered. Sprinkle with Himalayan rock salt and herbs. Bake for 40 minutes, 20 minutes each side. Kumara are rich in beta carotene – a form of vitamin A.
They’re also loaded with potassium and vitamins C and E.
Low in calories, high in fibre they’re packed full of antioxidants. Plus they’re gluten-free, anti-cancer, anti-coagulant (blood clotting), and help to balance your hormones.